This survey is a comprehensive comparison of all items that generally occur on a Profit & Expenses report. The results are expressed as a percentage of Gross Practice Turnover so that all practices can be compared to each other irrespective of size. A number of additional ratios are automatically calculated in the results to make for easy comparison. At the end of the day, whilst we may enjoy our work and work colleagues, it is the profit that determines the income of the practice owners. This is the fundamental reason that practice owners even bother to make the effort to open a veterinary practice. If profit did not exist we would have no reason to take on the challenges associated with running a practice. For these reasons, this survey is arguably the most important of all surveys that MPV Consulting provides for veterinarians. It will give you the opportunity to compare: your gross income streams; individual expense groups and subsequent profit. 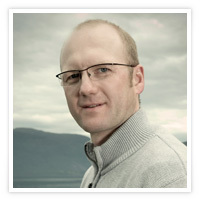 The results are broken down in a manner that clearly indicates how your practice has performed. Of particular interest are your performances in the major expense categories of Cost of Good Sold, Employment and Building. A number of ratios are calculated for you as indicators of performance. The bulk of the information for this survey will be provided directly from your P&L Report. 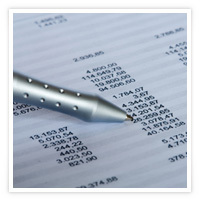 Expense information will need to be re-categorised into account headings provided by MPV Consulting. This is a relatively easy task that a novice can perform. Additional information will also be requested to make adjustments in order to standardise performance. These questions will relate to items such as payment adjustments for owner and rent for practice owned buildings. When a practice manager and/or accountant prepares a set of accounts for taxation purposes the outcome may not truly reflect the benefits that a veterinary hospital returns to its owners. We all attempt to institute legal methods of tax minimisation. This of course means that it becomes difficult to truly compare the owner benefits that may come from owning a veterinary hospital. The MPV Profit & Expenses Survey is aimed at truly comparing the total benefits an owner receives from the practice. It is for this reason that a number of adjustments are made in the survey information to determine a Marketing Profit (or Operational Profit) that will truly reflect these benefits. By answering the questions honestly a marketing profit will automatically be calculated to reflect the benefits that you as an owner have received. Why ‘Profit before vet salaries & wages’? All practices are slightly different in the way that they operate. They may be single veterinarian practices versus multi-veterinarian practice; they may have a single partner or several partners. Generally non-owner veterinarians are remunerated in a standard manner but often the methods of remuneration for owner veterinarians will vary between different practices. This then leads to difficulties accurately apportioning: what constitutes a fair market salary, what are owner profits and what are added fringe benefits. This leads to inconsistencies when comparing performance between practices. This simple way around this dilemma when performing benchmark comparisons, is to determine the profit before any veterinarians receive any remuneration. This will result in accurate and meaningful information for comparison. All surveys performed by MPV Consulting come with an assurance of confidentiality for individual clinic data. Individual clinic data will only be viewed by MPV Consulting staff or persons directly associated in the actual physical act of data collation for survey results. No information of any individual clinic will be supplied to any source other than the specified contact for each clinic. Should any survey involve sponsors or supporters, this will not, and will never, include any form of access to any individual clinic information without written permission of that clinic. 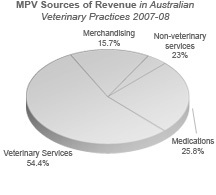 Australian veterinary practices have 4 main sources of revenue. The provision of veterinary service and medication for care of patients accounts for 80.2% of all revenue generated in veterinary practice. The balance of revenue is mainly from retail sales.